A few of the seam treatments are finished for the current crazy quilt project. I'm working them entirely in black, for reasons which will be explained later. All are my own designs, done using the waste canvas technique. - Although we are in the middle of winter here, perhaps you might like to consider collecting the fodder to make some of THESE for your summer garden. And if you want to see some more great ideas for garden art, have a look HERE. Be sure to scroll down! - If you like to burn candles (the ones that come in the jars) have a look at the tips HERE for re-purposing those jars. 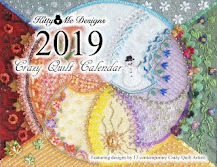 - If you've ever had occasion to sew with that lovely-feeling and oh-so-soft minky fabric you'll know what a pain it is to work with. There are some helpful tips HERE that might go a long way towards cutting down on the angst! 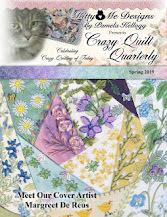 - For the quilters, perhaps you'd like to have a peek at all the fun star patterns available HERE. Today the quote is from an anonymous source..."Why do we close our eyes when we pray, cry, kiss or dream? Because the most beautiful things in life are not seen but felt by the heart"
DO you ever sleep??? Wow - this is stunning! Can't imagine the finished product. I loved that tip about the candle jars. I've tossed so many because even though I'd get the wax out by freezing, the residue was still there. MICROWAVE that and wipe out with a napkin?? Genius! Beautiful embroidery in your seam treatments Mary Ann. Good tips for working with Minky, thanks. A beautiful quote! Loving your seam stitches in black. Tell me, are these stitched with that 'cranky' sewing machine of yours? Those colors look great in my monitor. One of the seams reminds me of ballerinas dancing across the fabric. Love the black only stitching. It's looking ever so nice, my friend. You have me on the edge of seat wondering what your creation will turn out to be. I love that quote. And I love that stitching. The black is dramatic and beautiful. Wow! Love the way it looks! Beautiful and classy seams MA. The quote is so true. I have to agree with Carol here - same thoughts. The third design looks like dancing ballerinas.Love all of them, especially the second. Great to see all your seam treatments at a glance like that! Very kind of you! Your black stitches stand out very nicely against those lovely colours. You are going from strength to strength with your seams. Each is lovely. your own designs? I'mm thinking there's a book in there somewhere...lol...seriously though? Thank you so much for leaving comments! I appreciate you taking the time out of your busy life to talk to me. It's wonderful to know that someone is actually reading my mumblings and even more fun if I can connect with you and visit your blog. One foot forward and one foot back!